Ankara University Faculty of Educational Sciences Journal of Special Education, which is the first journal about special education field in Turkey, began its publication in 1991 and started to be published online in 1992. The journal has been published as a national peer-reviewed journal since 1995. Special Education Journal was published in print in 1991, through 1992 to 2015 it was published both in print and online, and since 2016 it has been published only online. It was published twice a year, since 2014 it has been published triannually as April, August, and December issues. Since 2018, it is published four times in a year as March, June, September, and December issues. Since 2008 Special Education Journal is indexed in ProQuest Political Science Journals, since 2011 it is indexed in EBSCO Host, and since 2014 it is indexed in The Scientific and Technological Research Council of Turkey (TÜBİTAK) Turkish Academic Network and Information Center (ULAKBİM) Social Sciences Database. Since 2016 it has been indexed in Turkish Education Index and Turkey Based Social Sciences Citation Index (SOBIAD) and since 2017 Emerging Sources Citation Index (ESCI). For the forthcoming period to be listed in Scopus and SSCI as well as other related indexes, we have made our applications. 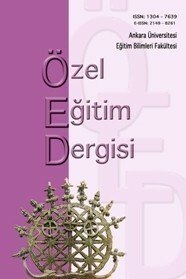 Ankara University Faculty of Educational Sciences Journal of Special Education is a peer-reviewed, academic journal which publishes scientific articles in the field of special education related to individuals with and without special needs from all age groups that is a review, quantitative, qualitative or mixed method research written in Turkish or English. The authors do not pay any fee during the upload of articles and publication process. Since the first day it was published, as a result of the efforts made by the members of Ankara University Faculty of Educational Sciences Department of Special Education, as well as the support of our readers, authors, and reviewers, the scientific quality of our journal has increased and the journal has filled a major gap in the field. Journal of Special Education, which aims to develop education activities and has a well-respected place in the field, continues to be published in the direction of academic, scientific, and ethical principles. Ankara Üniversitesi Eğitim Bilimleri Fakültesi Özel Eğitim Dergisi (Ankara University Faculty of Educational Sciences Journal of Special Education) is indexed in Emerging Sources Citation Index. For the related page of ESCI please click here. Since our journal is indexed in ESCI and it is under review of SSCI we have updated our publication rules. To access our current publication rules please click here. Since our journal is indexed in ESCI and it is under review of SSCI in accordance with our updated publication rules we also renewed our article template. To access our current article template please click here. The content of the Journal of Special Education is licensed under Creative Commons Attribution-NonCommercial 4.0 International Licence.